Sometimes I make questionable knitting choices. This shawl was one of them. Not because the pattern was poorly written. Not because I knitted it while tipsy on Smitty’s Irish Ale. And not because I made a poor fiber choice. What was questionable about this shawl was its timing. I picked up the yarn for this shawl and the stripey mother-in-law stole the same week. Both yarns called to me from their plastic wrappings and I displayed no will power whatsoever. I cast on both shawls, somehow thinking I’d find time to finish both of them by the time Christmas rolled around. For the record, this was really dumb. The stripey shawl, as previously mentioned,was intended as a gift. The Lady Russell Shawl was for me. Gifts are always higher in the knitting project pecking order, or at least they’re supposed to be. 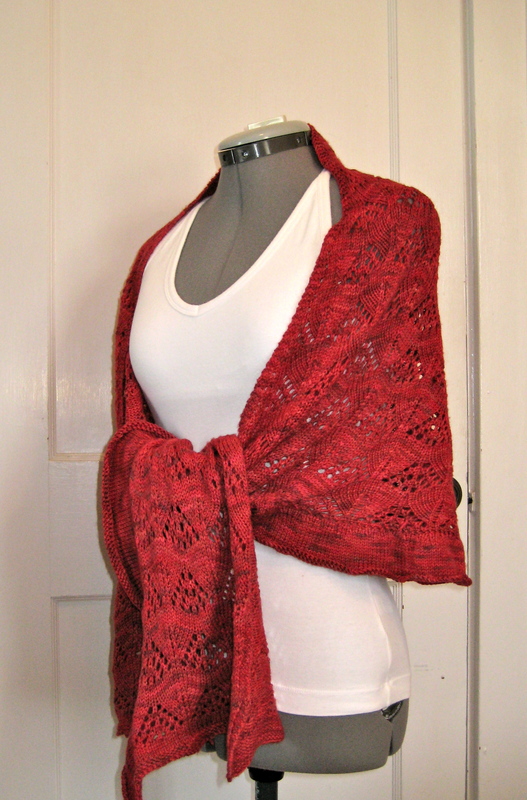 The problem was that the Lady Russell Shawl was a lot of fun to knit. 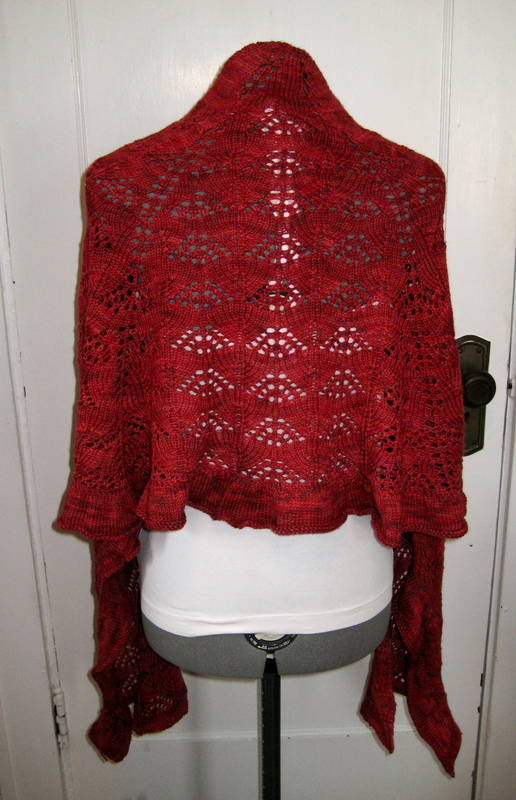 It distracted me with its lace and its cashmere and its gorgeous variegated red color. I lost myself in it and shamefully neglected the gift shawl. By Thanksgiving I had to face the situation: in order to finish the gift shawl in time for holiday gifting I would have to abandon my little red bundle of squishy temptation and devote myself to my priority project. After Christmas, I picked up Lady Russell again and set to. The weather had grown colder and I looked forward to wearing it to the office and out to concerts. Here it is. I love it. It’s the perfect shawl for me and a wonderful, cheerful color. 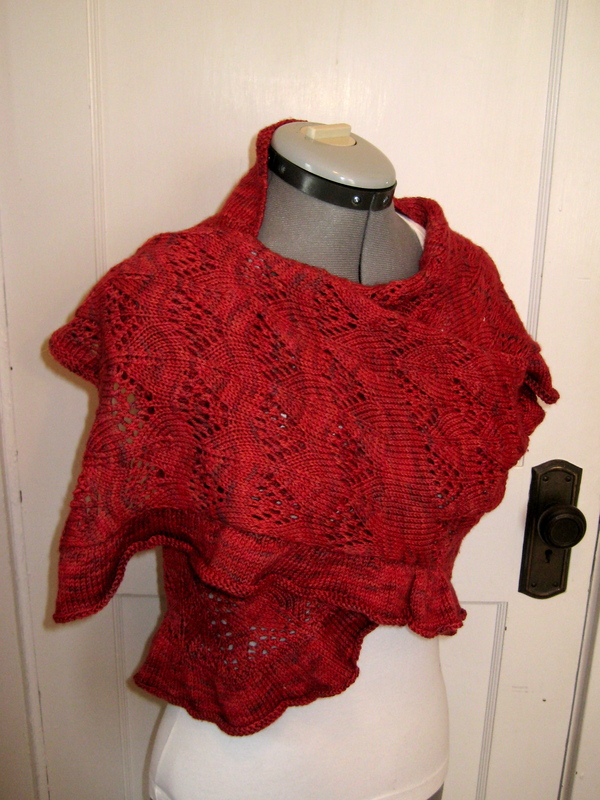 And unlike many toasty warm shawls, it completely fails to look frumpy. Worth the wait. The original pattern displays the shawl with its long ends tied under the bust. It looks great in the photo, but just feels odd to me when wearing it in real life. It’s beautiful! I can see how it would be a distracting knit. Q – Beautiful color and pattern! Super yum.